Tuesday Truths is Alicia’s weekly series on faith. Here, Alicia will discuss the ways in which her Christian faith has shaped her life and led her onto the path she is currently traveling. The goal is to foster an open discussion where viewpoints are considered and accepted. In this day and age, faith is seen by many as a taboo topic: something that should only be discussed behind the walls of a church and something that often breeds controversy. Peers of my generation often do not even discuss their faith amongst close confidants for fear of alienating them or pushing buttons. For too long, I have subscribed to these notions. Over the last year, I have devoted my life to writing, telling and sharing sports stories. My faith allows me to realize that it is God that has given me this opportunity. Yet, for the last year, I have not said that publicly. It is for that reason that I am launching the Tuesday Truths section of my personal website. My goal here is to share my ideas on Christianity and explain how my faith has shaped my life to put me in the position I am today. To begin the conversation, I want to provide some background on my faith. As we move forward, I will talk more about what I believe and how I apply Christianity to my life and the decisions I make in it on a daily basis. I was baptized in the Lutheran church at the ripe age of two months old. There was likely no question that this would happen, given that several of my maternal grandmother’s family members were pastors and my mother grew up attending Lutheran school. My earliest memories involve attending church with my grandparents and mom every Sunday. I always enjoyed going to church and my parents never had to fight me to get me there. My grandpa, on the other hand, was different. One of my funniest childhood memories is the time that my grandfather clearly was worn out from sitting on the pew for 80+ years. An hour before we were supposed to leave for service, he decided to take some laxatives to ahem, prevent him from attending. Well played, Gramps! While I would like to think that my parents would have allowed me to choose my own religion, one thing is certain: I have sought a relationship with Christ throughout my entire life. 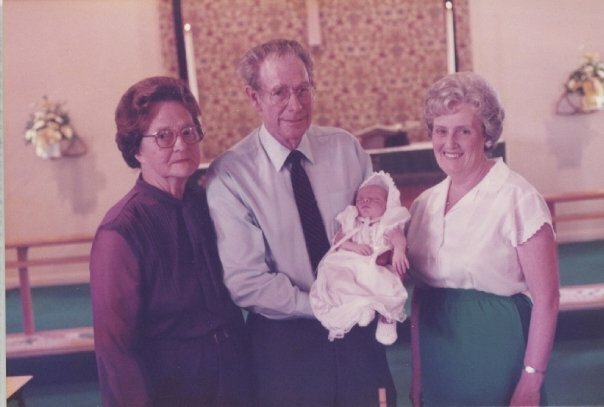 With both sets of my grandparents at my baptism in August 1984. At age ten, I received my first Communion. My maternal grandparents commemorated the event by giving me a Bible that sits next to my bed and is opened every night. At age 13, I began my first of three years of Confirmation classes. There, I not only made friends whose morals and values mirrored mine, but I truly began to understand what it means to be a Christian. At age 15, I confirmed my faith in Christ in front of my family and congregation. It is one of the things in my life of which I am the most proud. The morning of my Confirmation, the associate pastor at my church pulled me aside. She told me that she “knew” God was going to do big things with my life. Thinking back upon my life, I think I always knew that I had been given many gifts and that if I used them correctly, they would be put to work helping others. As a child, I always had incredibly high expectations of myself, oftentimes worked harder than my peers and placed heavier burdens on myself. While some didn’t understand why I did this, I knew deep down that I was working toward fulfilling the purpose God had created my life for. While I am a student of the Bible and a follower of Jesus, I was raised in a loving and accepting home. In my household, we were open to all, were quick to help people of all walks of life, and the only thing that was unacceptable was hatred of any kind. For that reason, one of the largest tenets of the Christian faith to me, is to love your neighbor as yourself. If you read the Bible, you know that there is no asterisk after that statement. We are taught to love our neighbor no matter who she is, what he believes in or what they’ve done. I strive to live every day and execute each of my decisions by remembering first my faith in Jesus Christ, and secondly, that I am put on this planet to love others regardless of who they are or where they are in life. My Dad often tells me a story about a time when I was a teenager and he asked what the best thing he and my mother did for me as parents. My parents, in my opinion, are two of the greatest that ever lived. They have done so many amazing, selfless things for me throughout my life. Rather than wracking my brain through all of the sacrifices they made to make my life better, I quickly answered: “You introduced me to Christ.” That introduction and the personal relationship that followed have made my life so much easier and better. It allowed me to succeed in school, develop strong relationships, show compassion to others and live a happy and fulfilling life. Yes, I have made mistakes in my life. My four years of college would arguably be the best demonstration of that fact. I sin everyday. However, the peace of mind I have in knowing that I am forgiven for the mistakes and sins that I commit as a result of my human nature is the greatest comfort in my life. It is that comfort and knowledge that allows me to wake up everyday with the hope that I’ll be a little better than I was the day before. It is that understanding that allows me to recognize the purpose my life was built for and to pursue it fearlessly. I’ve been given many gifts in this 28-year long life of mine. I consider the opportunity to share sports stories with the world every single day one of the largest of those gifts. However, I consider it an even greater gift to be able to discuss the source of those gifts. I look forward to sharing this journey with you all. How has faith shaped your life? Where are you today that you might not have been without faith? Great to read, makes me look forward to your 1230AM radio guesting that much more. LOVED this! This article made me think of Colossians 3:23. I’m so proud of you, Jessop!